I cannot find the words to adequately say how much I appreciate the almost two-year effort of my dear friend De’Andrea in Texas for this BEADED piece! It is stunning beyond description – different light hits it and a whole new image of this fantastic piece of art comes alive. We met in a weaving tool sale – and our friendship developed. I have hundreds of buzzards, vultures, and condors in such a variety of mediums – artistic renditions abound in our office, home of all these so critically important creatures. I’ve admired them since I was a child – realizing the importance of their function in our world. Thanks to my Cat for this photo! I’ve considered a “Sky Burial” for my body when it’s my turn. Thank you, De’Andrea – for such a profoundly beautiful Most Very Favorite of all time! Monday my very large new wood lathe will be delivered. Many fine and some very large turned pieces will come alive soon. Tomorrow we take my metal lathe and cabinet to the artists building my ’41 Ford pickup. It’s part payment for his work – I never ever used it or even turned it on. Stephen is anxious to add this to is shop. We’ll return with all of the pieces that came off the original truck – happy to have the truck and trailer to do that safely. Someone will froth to get it all – all pure original for someone wanting to restore that era Ford. The engine was perfect. Just that I wanted a performance truck…. All good things to everyone! Good Morning, All. These photos are of samples that Lori in Florida shared with me. I’m still not making looms but the tapestry was done on one of mine. 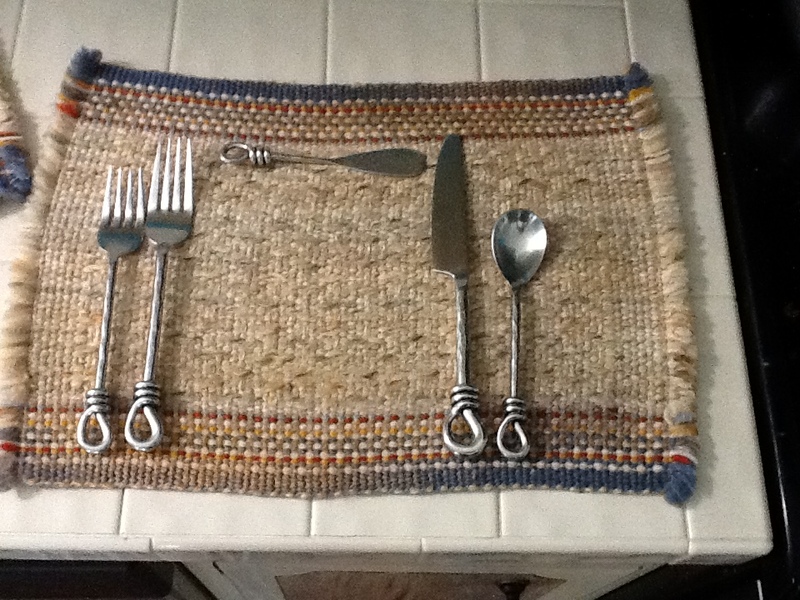 The placemat is so neat as well – who would want to disturb that image by putting plates on it? Thank You, Lori, for sharing. BTW – I’m loving not having a job. Still deeply involved in organizing my shop and made a couple of doodads for us. One was a small but very pretty box for Cat. The case is turquoise embellished Alligator Juniper and the top is nice Cocobolo. I’ll be getting into that theme soon. Still have much to do in general shop stuff. HUGE wood lathe coming! BIG Bowls! Today I’m starting dedicating at least two hours a day most days organizing the remarkable genealogy documents that Kat has been doing for me. There are 4 large binders ready for my 4 Grandparents and back. I am profoundly thankful to Kat for all that she’s done to help me along with this study. The connection with my past is quite dear. One 5GGF was a Revolutionary War Patriot! So, our military participation in the defense of and Creation of our Country is long. There have been very many in between. Yesterday I received the most phenomenal piece of art from De’Andrea in Texas, a long term friend that came about from my business. 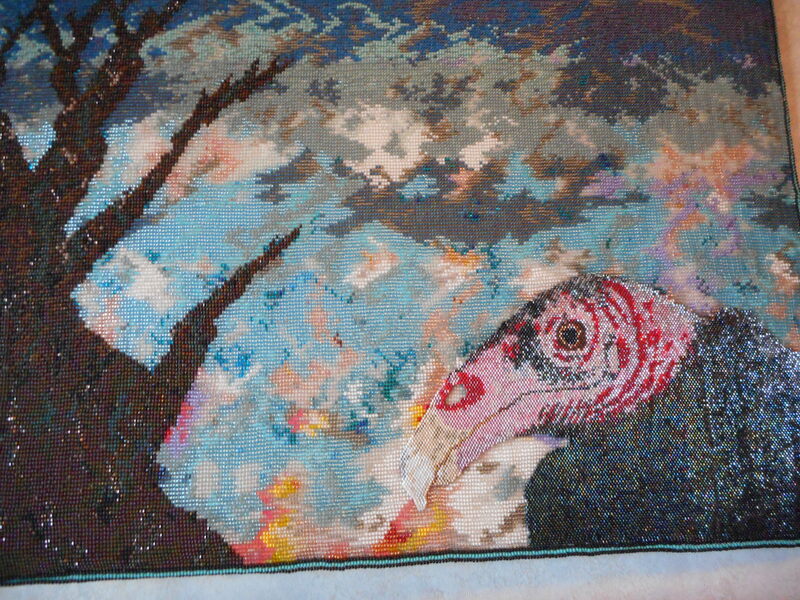 De’Andrea discovered my affection for Vultures and Buzzards – and offered to do a beaded piece of one. 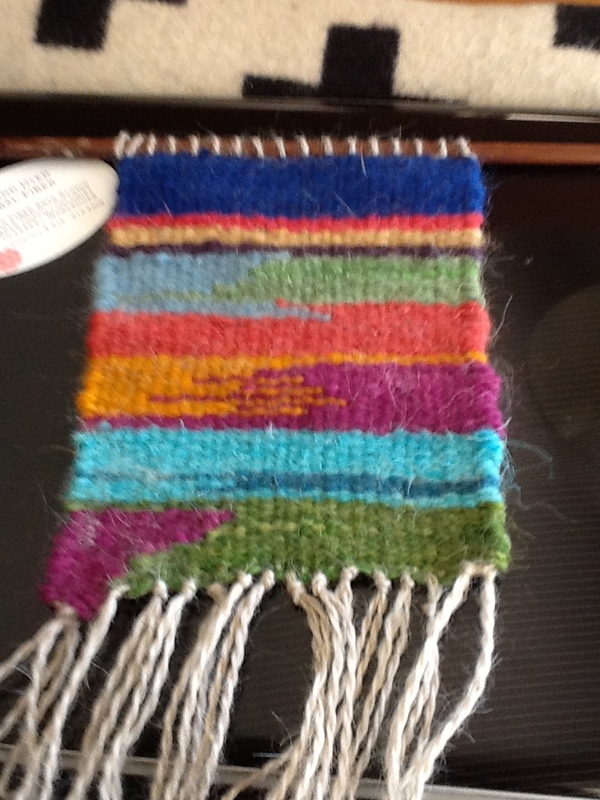 I located a photo of one I liked and she use it as the focus of her Fantastic wall hanging! Once we hang it properly I’ll post photo(s) of this stunning piece, 23 months in the making. How can you repay such a dedicated and wonderful effort from a famous bead artist? I’m so thankful. Just wait! My chopper is with David in Dallas. He’s the most thankful young person and I was so proud to share it with him. Gotta go – goodness to all!